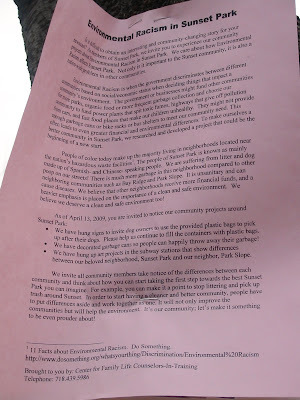 Brought to us by the Counselors-in-Training at the Center for Family Life, it invites news agencies to "experience our community projects about Environmental Racism in Sunset Park." It could be a response to the recent news about Astoria PowerGen's South Pier Improvement Project, but I doubt it. Supposedly, the project is to lessen the impact on Sunset Park. We'll see. While there are a lot of issues under the umbrella of Environmental Racism, this flyer focuses on "litter and dog poop on our streets!" The flyer goes on to say that the people organizing this project believe that other neighborhoods receive more funding and more attention to a clean and safe environment, presumable from our elected officials. But this is no "We're victims and we want someone else to change it" group. These folks have created a project that will hopefully show the community residents AND their elected officials that we deserve just as much clean air, poop-free sidewalks, and litter-free everything as our northern and southern neighbors. * We have hung signs to invite dog owners to use the provided plastic bags to pick up after their dogs. Please help us continue to fill the containers with plastic bags. * We have decorated garbage cans so people can happily throw away their garbage! * We have hung up art projects in the subway stations that show differences between our beloved neighborhood, Sunset Park, and our neighbor Park Slope. Also, I think they may have been referring to campylobacteriosis, and not camplobacteriosis. It does cause fever, but I haven't seen the threat of meningitis...just the threat of other very unpleasant effects. 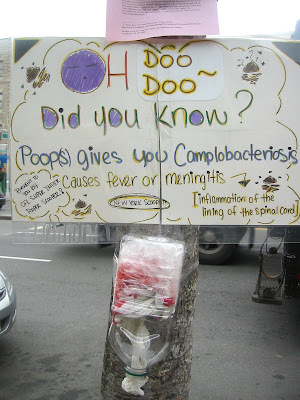 But even without the threat of long days on the potty, poop - or doo doo - is gross and should be picked up whether it's human, canine, or fowl. If anyone sees other projects by this group, take a photo if you get a chance and send it to bestviewinbrooklyn@yahoo.com. Too bad that their mentor(s) didn't know that driving a staple into a tree is environmental abuse- at best. It's also a crime punishable by law. Posting flyers/attaching stuff to trees and lampposts can also earn you a ticket from the DEP. Shame on the head trainer for not knowing better and passing on bad habits. Yeah, I noticed that as well. I guess that's a different limb of environmental racism and abuse!